Eligible voters across Afghanistan are registering for upcoming parliamentary and provincial elections while politicians try to shore up their alliances in preparation. Afghan Second Vice President General Abdul Rashid Dostum, a prominent Afghan Uzbek-ethnic leader and high-ranking government official who lives in exile, has become a pivotal figure for opposition rivals. Dostum’s lean toward incumbent President Mohammad Ashraf Ghani in disputed presidential elections in 2014 strengthened Ghani’s campaign. Since the general was accused in a criminal case more than a year ago, however, he has been in exile in Turkey, and some analysts say the court case against him was politically motivated. Several photos that circulated Friday on Facebook show Dostum in Ankara standing in the middle of a dozen prominent Afghan politicians and some of their representatives while holding their hands in a gesture of solidarity ahead of the long-awaited elections. 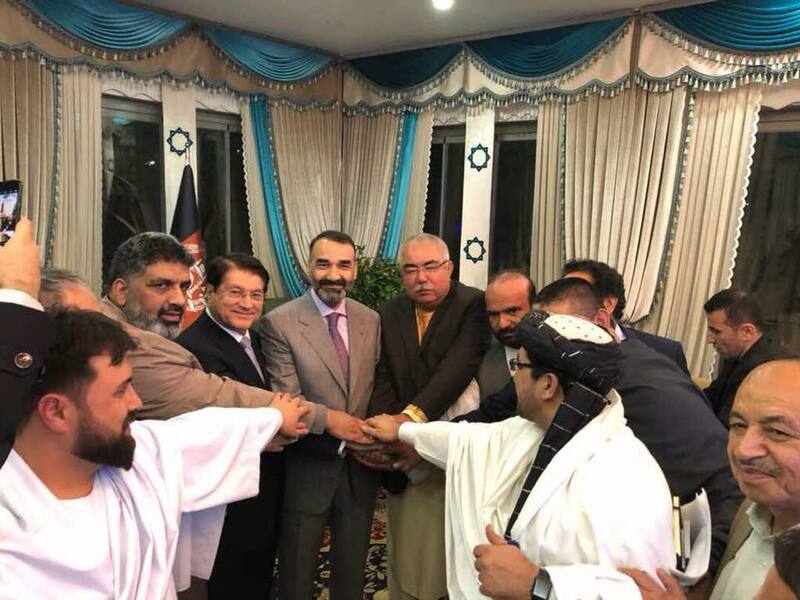 The former influential governor of northern Balkh province, General Atta Mohammad Noor, attended the meeting and touted the new alliance late Friday. With talks concluded on the formation of a “great national alliance of Afghanistan,” it is to be officially announced in Kabul, wrote Noor on his Facebook page and posted some photos taken at the meeting. “This alliance would execute to strengthen and reform the government, as well as to play an essential and leading role in provincial, parliamentary, and presidential elections,” said Noor, explaining their goal. “The alliance attempts the elections to take place transparent, fair, and free of fraud,” added General Noor. The new alliance appears to be a reboot of a previous alliance called “High Council to Save Afghanistan” established last year in Turkey with participation of many of the same politicians. Based on the photos posted on General Noor’s Facebook page, though, the new effort signals nationwide expansion with increased ethnic diversity. According to Noor’s post, the group includes representatives of most major political parties of various ethnicities, such as Pashtoon, Tajik, Hazara, and Uzbek. The new alliance was formed some three weeks after the registration of eligible voters began. The Afghanistan Independent Elections Commission reported Friday 1 million voters to date have enrolled for the elections. With just seven days left in the enrollment period, insecurity in some parts of country has hampered the registration process. The head of the Afghanistan Independent Elections Commission, Gula Jan Abdul Badie Saiyad, says the idea of extending the registration process is under discussion. Afghanistan parliamentary and provincial elections are set to take place on October 20, after a long wait and disagreement among current officials of the Unity Government of Afghanistan.